Pennington Field in Bedford, Texas, and Gaffney High School in Gaffney, South Carolina, will host Bands of America regionals on Oct. 6 and 13, respectively. A photo of Pennington Field in Bedford, Texas. The stadium will host a BOA regional on Oct. 6. // Photo from hebisd.edu. Owned and operated by the Hurst-Euless-Bedford Independent School District, Pennington Field was opened in fall 1987, and named in memory of former LD Bell football coach Fred Pennington. 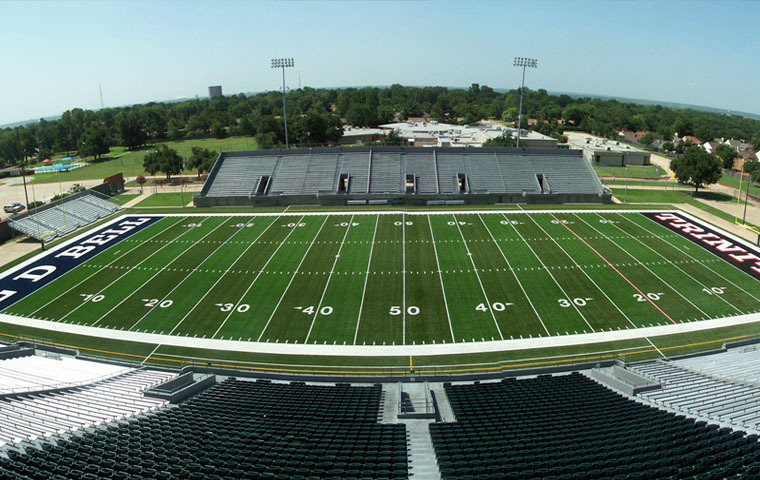 The stadium features a seating capacity of 12,500 and is primarily used as the site of home football and soccer games for the district’s LD Bell and Trinity high schools. Pennington Field is no stranger to marching band, hosting the HEB Marching Contest each fall. This year’s contest will be held just one week before the BOA regional. The stadium has also been a frequent host of UIL Region and Area marching contests, according to UIL records. The Dallas-area regional seems to have developed a reputation for changing venues every fall, having been held at a different stadium each of the last five years. This will be the first BOA regional held at Pennington Field. The regional in Gaffney replaces the Winston-Salem Regional, which was originally scheduled to take place at Wake Forest University. In early February, a Billy Joel concert was announced for the same date, forcing the regional to relocate. Located about 50 miles southwest of Charlotte, North Carolina, Gaffney High School's stadium features seating for 8,500 spectators and was opened in 2008. The venue has been used frequently for marching band events, hosting the school's own marching competition and SCBDA Upper State marching contests. Three regionals remain without confirmed venues: a Northern California regional on Oct. 20, a Mid-Atlantic regional on Oct. 20, and a Southern California regional on Nov. 3. What is the difference between pure water purification and other forms of water purification? Previously used filters used the structure of a sieve filter with a small size to prevent contamination, but its limitation was the inability to remove the toxic components, substances This is because the molecular structure of the baby is too small to produce a pure water source. These filters only help to purify the large scale before the RO membrane treatment.